The video is also available on YouTube. There are limits to how much Shipp reveals, but what he does reveal is important to know about. 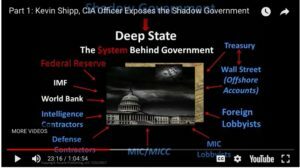 High ranking CIA officer risks it all the expose the Shadow Government/Deep State – that manipulates the elected government behind the scenes. Because, though there’s alot of good information given, it is what is known as a ‘limited hangout.’ – The stuff about 19 mideastern hyjackers the CIA knew about is just reinforcement of a lie. No mention was made of CIA connection to other agencies internationally, which changes the picture. No mention of what the CFR actually represents. -He is allowed to present information that is known anyway, as long as he slants the information away from some of the deeper truths that tie it all together. At least he connected it to the Globalists, but their conspiracy in progress represents so much more that is involved, like zionism and the ‘black nobility’ and the international central bank syndicate. The CIA serves the intrests of the international super wealthy, those banks and royal bloodlines. No one could prevent them from taking charge of the agency and incorporating it in their vast planetary network.